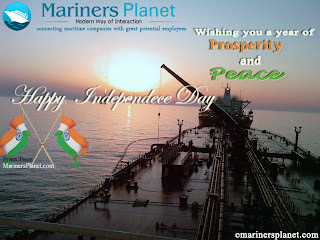 Mariners Planet Blog: MarinersPlanet wishes Happy Independence Day !!! MarinersPlanet wishes Happy Independence Day !!! Independence Day of India is celebrated on Fifteenth of August (8/15/47) to commemorate its independence from British rule and its birth as a sovereign nation in 1947. The day is a national holiday in India. All over the country, flag-hoisting ceremonies are conducted by the local administration in attendance. The main event takes place in New Delhi, the capital city of India, where the Prime Minister hoists the national flag at the Red Fort and delivers a nationally televised speech from its ramparts. In his speech, he highlights the achievements of his government during the past year, raises important issues and gives a call for further development. The Prime Minister also pays his tribute to leaders of the freedom struggle.